Ethan Hawke works remotely in "Good Kill." Photo courtesy of IFM Films. The short film, ensconced in the “Shorts: Interference" section, is having its world premiere at the 2015 Tribeca Film Festival. Screenings continue tonight, as well as Friday and Satruday (24 and 25 April). At a dreary diner in the middle of a California nowhere, drone pilot Harry Fisher (Austin Nichols) and Silas (Amy Sloan), a woman he has just met, are chatting amiably enough, until Silas brings him to the point: He has to kill the man he has come to meet or she is going to blow up the whole friggin’ diner, the state and possibly the world. In the director's note, TI says “Nostradamus” is inspired by “Strangers on a Train.” Whether the reference is to Hitchcock's film or its source material, the novel by Patricia Highsmith, it matters not. Essentially, murder most foul will happen. In “Nostradamus,” there is actually a twist: You will murder one and I will not murder many. As has been noted (http://www.bit.ly/1O8QtCg), there are numerous films in TFF2015 that might run as companion pieces because of their subject matter. In this case, “Good Kill,” would be a natural complement to “Nostradamus." 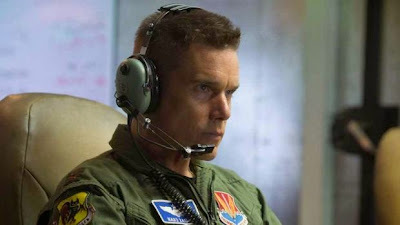 The Andrew Niccol film stars Ethan Hawke as a put-upon drone pilot who does his killer job from a Nevada trailer. It's having its U.S. premiere and screenings continue Wednesday and Thursday, 22 and 23 April, respectively. Meanwhile in “Nostradamus,” Harry and Silas are very attractive people – with all-American looks and appeal – the kind most people would welcome as a neighbor. However, they are among the most dangerous people on earth – the last any should wish to live near. As it becomes clear in “Nostradamus” what is at stake, the faces of AN and AS take on increasingly disturbing expressions, registering doom minute by minute. In the wake of this clear and present danger, Harry maintains a calm exterior and a clear mind, owing to years of military training. Similarly, Silas — military, herself — is as serene as you please, munching on bacon as if she has not just threatened Armageddon. Look closely and see fleeting light from TI’s camera capture a glint of insanity about her latter expressions. The tension is real and palpable, pushing one to the edge of his seat as befits any good thriller. The surprise ending is gravy. TI and co-screenwriter Joshua Banta deliver spare and engaging dialogue well-suited to the subject matter. Films/events on today's TFF2015 schedule: ”Man Up,” "Fastball,” “Ashby,” “Wondrous Boccaccio,” “Shorts: Interference,” “The Wolfpack,” “Tribeca Talks: David Rockwell & Danny Meyer, How Does a Space Tell a Story” “Bad Hurt,” “Being 14, “Dixieland,” “Peggy Guggenheim - Art Addict,” “Havana Motor Club” and ”All Eyes and Ears."